APPEARANCE: Hitotsume nyūdō could pass for human priests if not for the large single eye in the center of their faces. They dress in luxurious robes and travel in enormous, ornate palanquins carried by lesser yokai – or sometimes human slaves – surrounded by a splendid precession fit for a corrupt abbot or a rich lord. The fantastic procession is enough to make most travelers stop and stare, wondering what nobleman or lady might be riding inside; but when the palanquin stops and hitotsume nyūdō comes out, it means trouble for any who happen to be nearby. BEHAVIOR: Hitotsume nyūdō are one of the most demonic types of ō-nyūdō. They roams the roads and highways outside of the cities, assaulting lone travelers unfortunate enough to get in their way. With their long legs they are faster than most humans, so running away from them is impossible. Like many giants, they are able to increase and decrease their size at will, growing taller than the highest trees and trampling them to crush any who might be hiding among them. 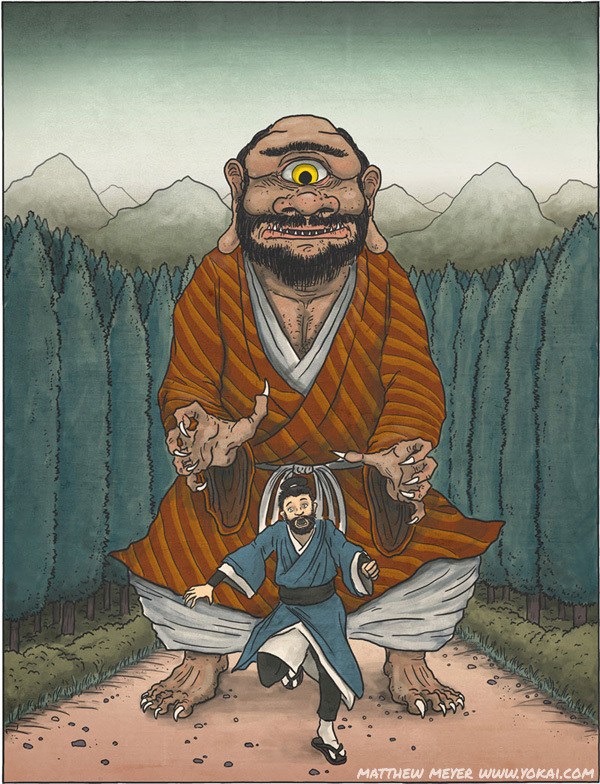 Hitotsume nyūdō attacks are occasionally blamed on mischievous kitsune or tanuki disguised by transformation magic. LEGENDS: A legend from Wakayama tells how a man, traveling along a wooded road, came across a splendid procession unlike any he had ever seen. He climbed a tree to get a better look, and as the procession approached, it stopped just as it reached his tree. There was a frighteningly large palanquin, and out from it stepped a giant, one-eyed monster. The creature chased after the man, climbing the tree he was hiding in. In a panic the man swung his sword at the creature. At the very moment he did so, the hitotsume nyūdō and the entire procession vanished. One hitotsume nyūdō frequently seen outside of Kyoto was said to be a reincarnation of a particularly fierce abbot of Enryaku-ji, renowned for his strict discipline. In life he was known for expelling lazy monks from his temple. He saw the world as growing increasingly secular and wicked, and he constantly lamented and criticized the corruption and sin of the monks of his day. After his death, it is said he was reincarnated into a yokai to continue punishing the wicked and impious clergy.